A lot has changed since early 2001. We've got a new president approaching the end of his first term, the US has embarked on two major wars and the words "Lady Gaga" have become much more than just gibberish. Some things, however, don't change. In nearly each of these intervening years, Apple has issued a major update to its desktop operating system, OS X. This time last year, the company issued OS 10.7 Lion, a king-of-the-jungle moniker many thought would mark the end of Apple's big cat naming scheme and, by extension, the OS X lineage. In February, however, the old operating system showed she still had some life left in her, when the next edition was revealed, arriving over the summer and called Mountain Lion. Based on the name alone, you'd think 10.8 would be a modest improvement over its predecessor -- not unlike the baby step between Leopard (10.5) and Snow Leopard (10.6). But Apple insists that this latest build is more than just a seasonal refresh -- in all, it boasts more than 200 new features. 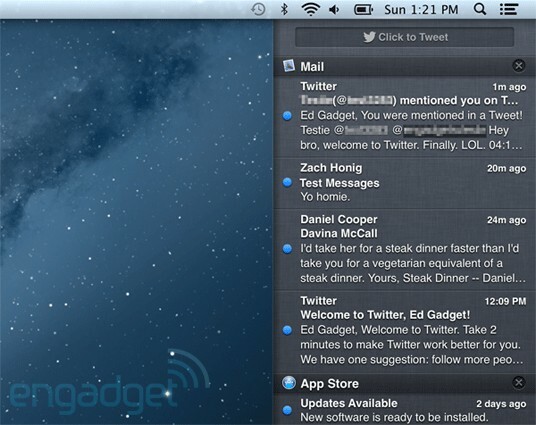 Some are major, including things like a new Notification Center, AirPlay Mirroring and a desktop version of Messages. Others, such as full-screen mode for Notes... not so much. What seems to unite the vast majority of the 200 features, however, is a nod to iOS. So, how easily can Mac users justify that $20 download? Follow along after the break, as we put those 200 features to the test. 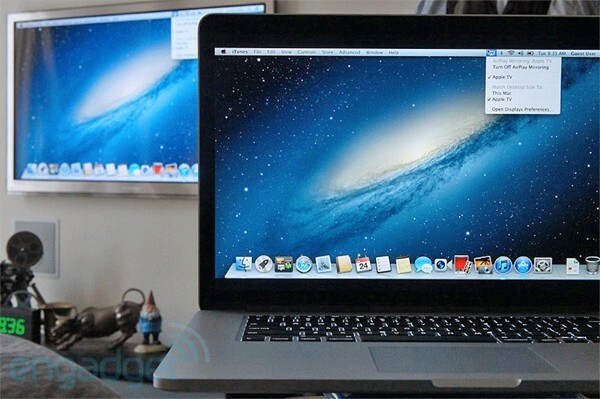 Mountain Lion's 200-plus new features add up to a welcome upgrade at a nice price point. 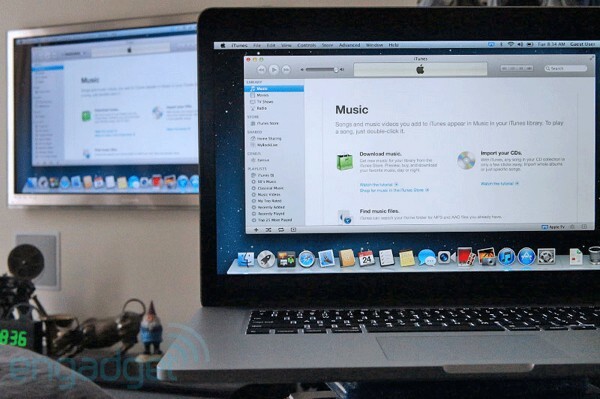 How would you rate the OS X Mountain Lion? Upgrading to Mountain Lion couldn't be easier -- assuming you have the kind of internet connection that can reasonably handle a 4.34GB download. If you don't, well, you may want to look into spending a morning at your nearest Starbucks. Apple won't be releasing the software on a USB stick like it did last time, so downloading from the Mac App Store is your only option. If you previously made the jump to Lion courtesy of a downloaded update, you should be quite familiar with what goes on here. It's a simple sequence of waiting for the download, sitting through a few reboots and then, presto, you have a new OS. We ran the upgrade on a late-2010 MacBook Air with a Core 2 Duo processor and the install process took just over 30 minutes. Faster machines will likely chew through the installation code more quickly. OS X reached its 10th anniversary last year. When it was first introduced in 2001, the operating system was something of a revolution, surpassing its predecessor and, arguably, what was then the most current version of Windows. In the past 10 years, Apple's desktop OS has seen its share of changes, with a major point upgrade coming nearly every year. With the release of Lion 12 months ago, many suspected the company had issued the final installment in the OS X story, but Apple had at least one more up its sleeve. With that in mind, it's no surprise that Mountain Lion bears more than a passing resemblance to its similarly named predecessor. In fact, out of the box, the only striking difference between 10.7 and 10.8's respective desktops is a new default wallpaper. (Clearly, Apple wasn't through with its celestial theme.) As with Lion, hard disks and other drives won't show up on the desktop by default, but you can easily adjust that in Preferences. Though Apple crammed more than 200 features into its latest OS, these upgrades don't include any significant changes to the overall look and feel -- certainly, it's nothing like the transition from Win7 to Windows 8, which will also be released within the coming months. That said, the Finder has gotten a bit of a facelift. First up is the introduction of an inline progress indicator for file transfers from a drive or server -- one of many features borrowed from iOS. In addition to the traditional progress window that pops up in the middle of the screen, a small white bar is overlaid on top of a grayed-out file icon, letting you know how much of the transfer is left. A big "X" also pops up on top in the upper-left corner, if you get cold feet about moving files back and forth. Addressing a complaint in 10.7, Apple has made the sidebars in Finder windows a bit more customizable, so that drag-and-drop functionality now includes categories. In other words, you can pick up and reorder things like Favorites, Shared and Devices to suit your quick-selecting needs. Another handy addition is the ability to encrypt files from the comfort of the Finder sidebar -- just highlight a drive and either click Control or give a two-fingered tap to the right side of the trackpad to protect it from prying eyes. Enter a password twice followed by a hint and your machine will start encrypting. If you thought Apple had already used up every possible swipe and tap combination, boy have we got the one-handed gesture for you -- tap three fingers on a file or folder, and you'll get a preview window, offering up an icon, the name of the file, its version and size and an option for opening it. In the case of multimedia files such as movies, you can hit play without launching a separate program. Once that window is open, you can preview other apps by highlighting them with the cursor, which should prove a boon for people who prefer large icons. 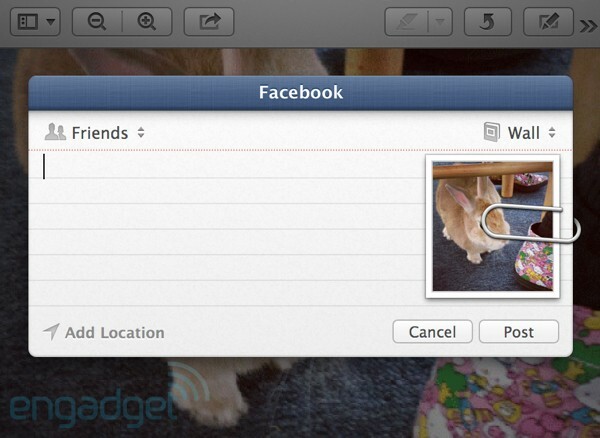 Like the Finder windows, the Preview also features the new share button, a near-ubiquitous addition to Mountain Lion that allows you to transfer files through a variety of methods, tailored to different apps. These include email, Message and AirDrop. Here at Engadget HQ, there's no single Mountain Lion feature we're more excited about than AirPlay mirroring. It worked on the iPad, so why not bring it over to OS X? Using an Apple TV, you can beam movies and other content from your computer to an HDTV at up to 1080p. The setup couldn't be more straightforward -- get your system and Apple TV on the same wireless network and the AirPlay logo will pop up in the right-hand corner of your desktop. Select Apple TV from the drop-down menu and it will start to glow blue. You can then chose to have the system either scale to match the resolution of your desktop or just fit it to the TV. Whatever you own, you'll also need a second-generation Apple TV or a newer model. You can run, but you can't hide from the Share button. 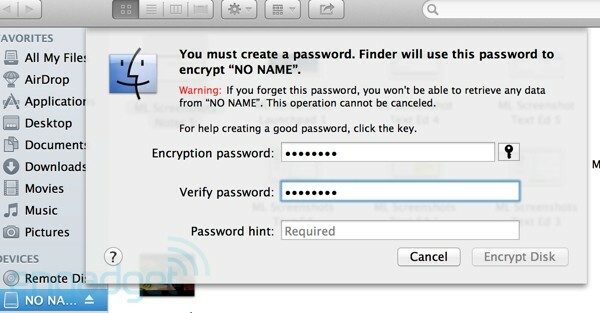 Apple's integrated this feature into just about every first-party app in Mountain Lion. Cupertino clearly knows how devoted you, the Mac user, are to the various social networks in your life, and it wants to save you a few extra steps when it comes sharing content. Notably, these sharing options include a number of third-party services, including Twitter, Vimeo, Flickr and Facebook (in beta until later this year). And while Apple's not going out of its way to highlight a certain Mountain View-based company -- it programmed a Safari bookmark for Yahoo, of all things, but not Google -- YouTube is included as a sharing option in QuickTime. (Interestingly, this doesn't apply when a QuickTime file is highlighted in the Finder, for some reason.) Apple's done a good job tailoring sharing to different services -- Finder, for example, just offers up email, Message and AirDrop, while Preview includes all those options, plus Twitter, Facebook, Flickr and iPhoto. It's hard not to note certain oversights with regards to the selection here -- while Apple's mostly done a good job including heavy hitters, we'd love to see services like Google+ and Viddler included in future releases. Some apps, like DropBox, might be a tall order, given their overlap with Apple's own offerings, such as iCloud. If sharing were anything less than idiot-proof, it would be hard to imagine it becoming an essential part of people's workflows. After all, pasting a link to Twitter or uploading a photo to Flickr are already straightforward options -- as is AirDrop's close-proximity peer-to-peer sharing, which was introduced in Lion. That said, Apple made the whole ordeal as simple as possible. Click the Share button in your chosen program (or from Finder, with your chosen file highlighted), select your sharing method from the drop-down menu and send it off. Obviously, with Twitter, Facebook and email, you'll want to add some context, too. You can do all of that from a "Share Sheet," Apple's sharing interface, which offers up an image of the file you intend to send, paper clipped to its side. The first time you attempt to send something using email, Twitter, etc. you'll be prompted to add an account, at which point the Mail pane will open in System Preferences. Once signed in, you're good to go across all of the apps that use this functionality. In the case of Twitter, Mail and Facebook, messages will be delivered directly to the Notification Center once you're logged in. 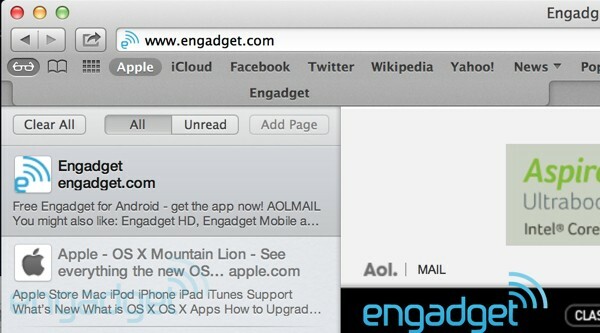 Sharing is just one of many features in Mountain Lion ported over from iOS -- take a look, even, at that little arrow icon, first used in the mobile versions of Mail and Safari. In the context of the iPhone and iPad, this feature is a necessity. On the desktop, not so much -- not with true multitasking and all that screen real estate anyway. Still, as unnecessary as it may seem, it's a nice addition to the OS. And, unlike other features introduced in this release, we can honestly see ourselves incorporating this into day-to-day workflow. The most significant addition to Finder in Mountain Lion is actually hidden away -- or rather, pushed to the side. Your first hint that the Notification Center is even there is a rather plain graphic added to the upper-right corner of your desktop's toolbar: three parallel lines, the one in the center slightly shorter than those flanking it, with three square bullet points to their left. Clicking this will shift the whole desktop (save for the toolbar) to the left, revealing a hatched gray pane, the Notification Center. Just how far the whole thing shifts depends on the resolution of your monitor -- using the new 15-inch MacBook Pro with Retina display at a medium resolution, the display moved by about a fifth of the screen. 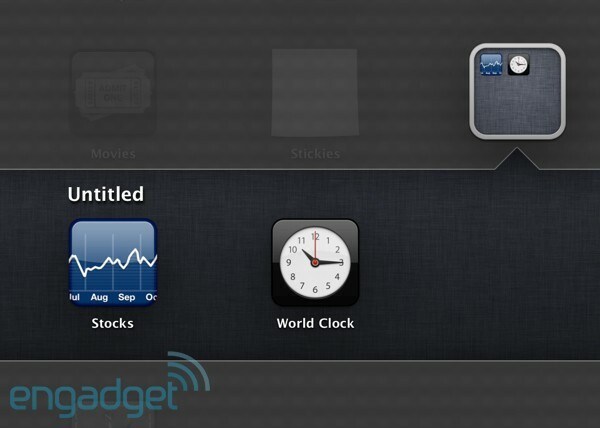 Notification Center can also be accessed with a two-fingered swipe, right-to-left, starting from off the trackpad. If you were worried that Apple was having trouble figuring out how to utilize screen real estate opposite the Dashboard, worry not. Shifting everything back is a simple matter of swiping the other way or clicking the icon or the desktop itself. If you're wondering just how liberally Apple borrowed from iOS in Mountain Lion, take a little trip just off to the side of the desktop. Notification Center mimics iOS' drop-down notifications, right down to the color scheme. All important messages (and plenty of non-important ones) flow through here: email, Twitter, Facebook (coming soon), Messages, Calendar appointments, reminders and updates from OS X, the App Store, Safari, Facebook and Game Center. Click on a note and it will open up the full message / alert in its respective program. Not keen on checking the Center every few minutes? Fear not: before populating the sidebar, the notes appear as a small banner in the upper right corner of your desktop (sorry, Growl), where they linger for a few seconds and then disappear, vanishing into the ether. 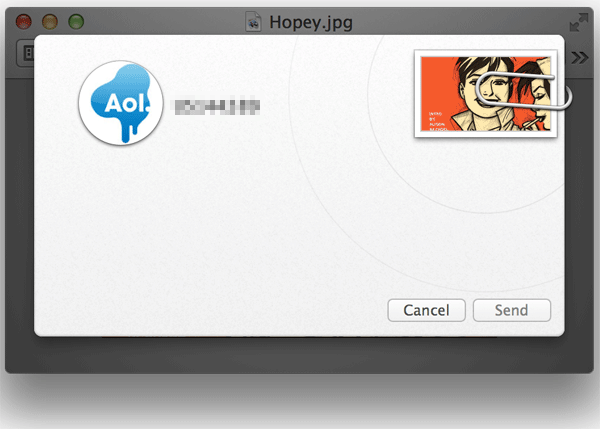 You can speed up the process by swiping them offscreen using the trackpad. More important notes -- system updates, reminders and calendar appointments, for example -- show up as alerts, which need to be dismissed before they go away. No, you can't blame missed meetings on ol' Mountain Lion. 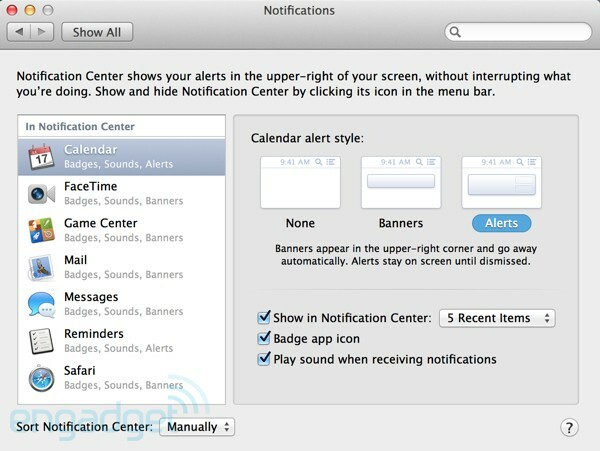 With the addition of banner alerts, Notifications go right to the forefront of the OS X experience -- unless you go into settings and disable them (or just never sign into any accounts), it's awfully hard to avoid them. Not that we'd want to. Notifications are a truly handy addition that should fit quit comfortably into most people's workflows. They never felt particularly intrusive to us (especially since they disappear after a few seconds), but again, on days when you can't handle Twitter screaming for your attention, tuning out is as simple as rejiggering the settings. Messages, wherever: Mountain Lion, left; iPad, right; iPhone, below. Mourn not the loss of iChat -- Apple's long-running chat client had a good run, but things change, software evolves and mobile apps get absorbed en masse by desktop operating systems. It's the circle of life, really. iChat is being put out to pasture a month ahead of its 10th birthday, making room for another friendly face: Messages. The iOS client has been fully grafted onto OS X, and compared with other mobile-inspired features in Mountain Lion, Messages is arguably the most comfortable fit. After all, Messages is simply unavoidable in iOS. Integration here means you're able to communicate directly with anyone who has an iOS device. 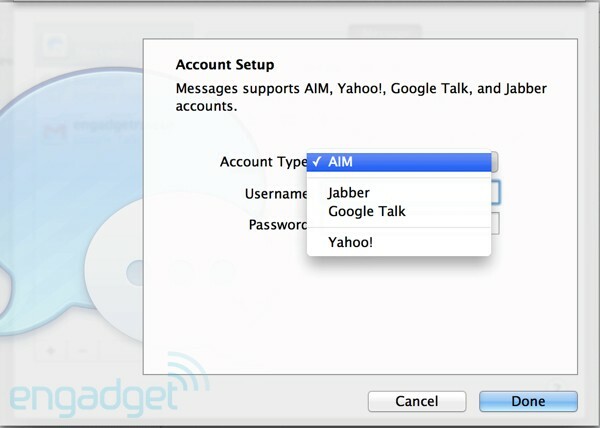 Thankfully, however, it's not just a closed Apple system; services that had been supported by iChat -- AIM, Google Talk, Jabber and Yahoo -- are included here, too. Save for the touchscreen keyboard, the app looks pretty much the same as it does on the iPad. The left side is where you'll find different conversations, with a search bar at the top. The main pane, meanwhile, shows dialogues with the usual word bubbles -- by default, you're on the right side in light blue, and your friend is on the left in white, but you can tweak colors (as well as fonts) in the settings. As ever, you'll see an ellipsis when your friend is typing. Additionally, you can send messages to a phone number or email address (with a autocompletion if it's in your address book and connected to an Apple ID). If you happen to have Messages closed while someone's attempting to get your attention, a notification will pop up in the corner of your desktop. 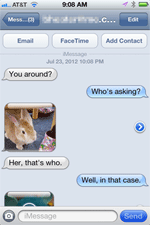 If you're online, a new conversation will pop up in the left column, with a blue circle showing it's unread. You can add attachments like photos and video (up to 100MB), both of which will show up inline. Video, however, will open up in a separate player when you click on it. Speaking of video, you can click the FaceTime button in the upper-right corner to cut straight to staring at your friend's beautiful mug. Group messages are also possible by typing multiple names into the "To" field. The desktop version of Messages supports full-screen mode, message forwarding and lets you set delivery and read receipts, so you know your messages are getting through. 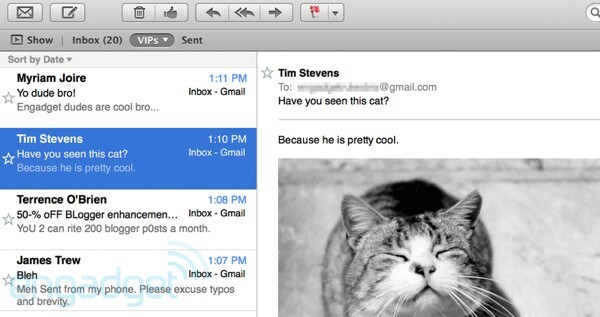 Not a ton of changes on the Mail front, though Apple's made a few tweaks to its email client. Chief among these is the addition of VIPs -- a priority inbox of sorts that lets you hand-pick the folks who should skip to the front of your ever-flooded inbox. Hover over the email address of a sender and you'll see a little hollow star. Click this and, boom, that person gets the velvet rope treatment. You can view them and all their fellow Cristal-drinking emailers by clicking the VIPs tab in the mail toolbar. The rest of the riffraff will have to wait. It's worth mentioning too that Mail's got an itchy spam-filtering trigger finger. You'll want to do some inbox training when you first get started. Speaking of preferences, all of your favorites, recent senders, signatures, smart mailboxes and other account info gets pushed out to iCloud and, by extension, all of your connected devices. Search in the Mail app has been souped up a touch, too -- start typing and it starts filtering, weeding out results that don't match. And skipping to the top of your inbox is as simple as clicking the sort bar at the top, in the blank space to the left of the actual "Sort By" drop down. Oh, and if you're looking to email a webpage, you can do so by clicking the Share button in Safari and selecting Mail from the drop down. A blank message will pop up, letting you chose how you want to deliver that content -- in Reader View or as a webpage, a PDF or link. 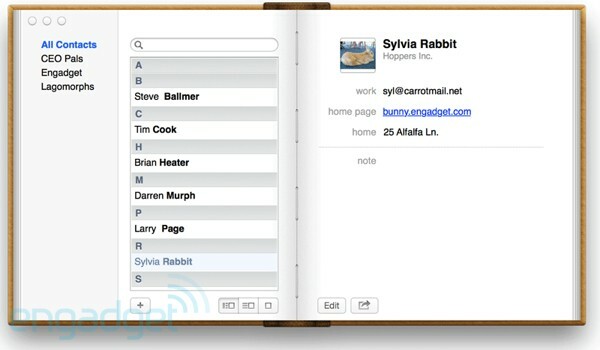 Address Book is now known as Contacts (*cough* iOS). Name change aside, things haven't really changed. A share button has been added, so you can send contact cards via email, Message and AirDrop. There are categories now, too -- you can add those by selecting New Group from File, dragging and dropping selected contacts into the categories. Handily, the Contacts app combines info from multiple sources -- email address, phone numbers, etc. -- into single entries, so you don't end up with multiple cards for any given person. 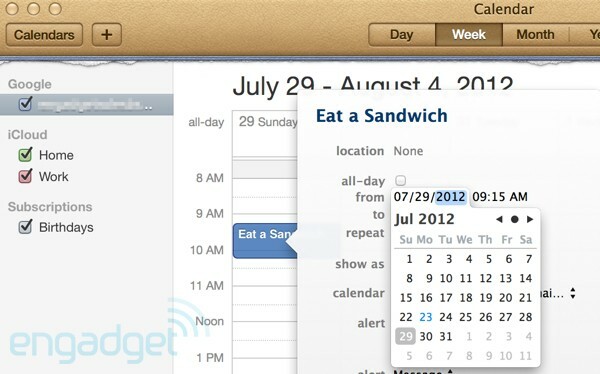 Similar to Contacts, iCal has been renamed Calendar to match its iOS counterpart. On the whole, though, the program looks nearly identical to its predecessor, down to the faux leather gracing the top pane, and the remnants of torn-out pages. There are a few minor tweaks here and there -- for one thing, the menu for toggling between multiple calendars (e.g., Work, Home, Gmail, etc.) has changed from a drop-down dialog box to a sidebar on the left. Calendar's search, meanwhile, offers up events on the right side, rather than the bottom, where it sat in Lion. That search features offers up suggestions and search "tokens," which can be combined to create more specific searches. The date selector inside of an event now offers a small pop-up calendar, making it easier to choose a date by allowing you to go back and forth between months. And, of course, once events are added to the calendar, they'll feed into the Notification Center, sitting at the top of the screen until you see fit to dismiss them. 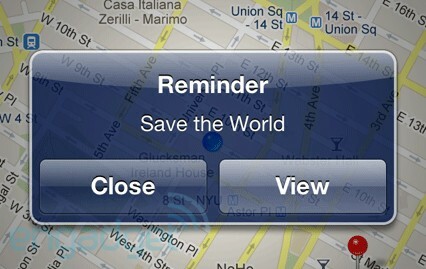 As in iOS, Reminders live outside of the Calendar. The app, new to OS X, looks a lot like its iPad counterpart, except with a few aesthetic tweaks, including a more leathery theme and more detailed texturing in the app's binder paper. Rather than relying on the List / Date buttons on the left sidebar, the desktop version has a calendar in the bottom left (though you can make it disappear by hitting the calendar button at the bottom). Using the calendar, you can refine the reminders by day (though not by month or week), so you can see everything you need to do on, say, July 25th. Reminders are organized by categories in the sidebar. You can toggle between them by highlighting your chosen category or doing a two-fingered swipe left and right on the reminders themselves. Clicking the triangle icon in the bottom left-hand column will collapse the app into one column, removing categories from the view. This popped up on the old iPhone 4. Pretty handy. The reminders get pushed to your devices via iCloud, appearing on the device you're using when the time comes to remind you. Really, that's what this app is all about -- it's less a desktop application than a counterpart to a feature that many are already using on their mobile devices. Notifications are key here. We've had some difficulty incorporating these sorts of applications into our daily lives -- particularly on the desktop. The ubiquity of the notifications, however, may be enough to give it one more go. Naturally, Apple would love few things more than to wean you, the OS X user, off of your Chrome / Firefox dependency. As such, it's added a sprinkling of welcome features to help sweeten the pot. Chief among these is the new Smart Search field, which, to be honest, is more of an "it's about time" addition than a truly innovative feature. In short, it incorporates predictive search into the address bar. If you've used Chrome, you know the drill: start typing and Safari will start listening, pulling up suggestions based on your search history. As with Chrome, results from your Bookmarks and history are listed below the suggestions; Apple does a good job separating these results from one another, with a horizontal line. The space just to the left of the toolbar has gotten a bit more crowded, too, with the addition of an iCloud logo (only once you've enabled that functionality in System Preferences) and, of course, that ubiquitous new Share button, which is home to Add Bookmark and Add to the Reading List, on top of the standard email / message / Twitter functionality. The iCloud feature, meanwhile, offers up compelling functionality for iOS users through iCloud Tabs, letting you pick up where you left of on your mobile device. It is, of course, not unlike Google's Chrome Sync feature, creating synergy between the companies' desktop and mobile operating systems. But while Chrome's recent appearance on iOS will likely lessen many users' dependence on Safari, as long at Apple's browser continues to be the default option on the iPhone and iPad, it's likely to continue to be the most popular web browser on those devices. Speaking of tabs, the new Tab View feature does a good job incorporating the glass trackpad into the proceedings. Pinch with two fingers and the tabs will shrink down, arranged flat on a gray background, just under their respective page titles and URLs. From here, you can quickly scroll through the pages. It's a nice feature, to be sure, but it's not likely to become an essential part of the workflow for too many people outside of Safari power users. For all of Apple's unabashed love of all things cloud-based, one new Safari feature does actually manage to acknowledge the fact that we can't always live our lives online. 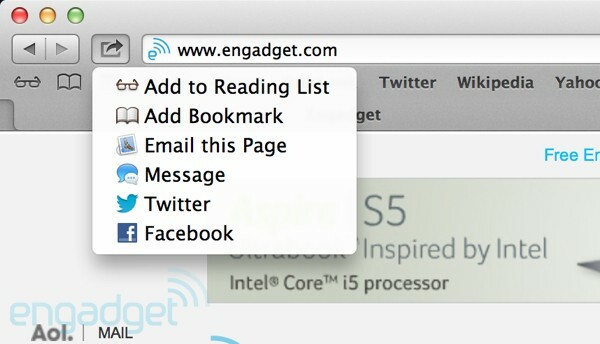 Reading List, that icon with the little spectacles that sits along the bottom of the Safari toolbar, now does offline browsing, a feature that actually manages to distinguish itself from bookmarks, something Apple didn't properly manage in Lion. Save something to Reading List (either through the Bookmarks drop-down menu or the Share This icon next to the toolbar) and you'll have to wait just a bit while system caches textual and graphic elements. And sure enough, if you fire up Safari offline, you'll be able to read full pages, images and all -- a handy little feature for reading news stories on the go, should you plan on taking your computer on the subway or on a plane that doesn't offer WiFi. But what about the seemingly endless strings of passwords we're forced to remember? Has Safari done anything to make them easier to manage? We're glad you asked. When you first fire up the browser, Safari will ask, many times over, if you'd like it to remember this password or that. You can either agree, put it off for later or just do away with the question altogether. It's a bit of a nuisance when you're first getting started, but if you've got a machine no one else will be using, it's a useful feature, particularly for those who have more individual passwords than the human brain could be expected to retain. With iCloud at the epicenter of Apple's cross-device push, it's hardly a surprise that it's the cornerstone of this latest OS upgrade. Cloud-based storage is, after all, the glue binding much of the OS X and iOS experiences together, syncing your contacts, notes, reminders, calendar appointments and Safari bookmarks. As such, the company has gone out of its way to simplify the process. Sign in with your iCloud account and Apple gives you a chance to opt out of syncing all the above-mentioned services, as well as set up Find My Mac, for locating and remotely wiping a lost PC. Once signed in, iCloud lets you pick and choose which services you want to sync: Mail, Contacts, Calendar / Reminders, Notes, Safari, Photo Stream, Documents, Back to My Mac and Find my Mac. After you opt in, Apple will begin the great syncing, pulling data from your iOS devices onto your computer and vice versa. If you uncheck one of the elements, it will remove the synced data from your computer (though not before warning you). 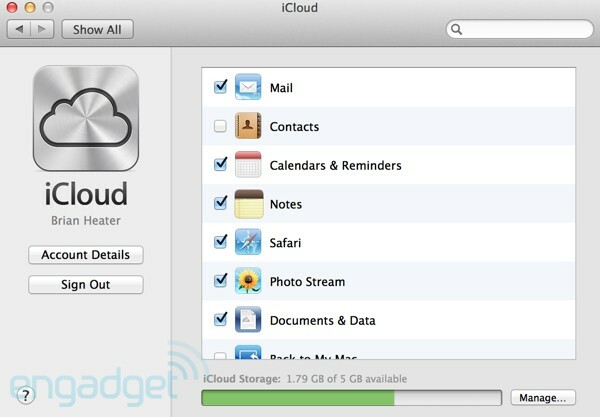 The primary iCloud page also offers up a status bar on the bottom, letting you know just how much of that iCloud storage you're currently using. 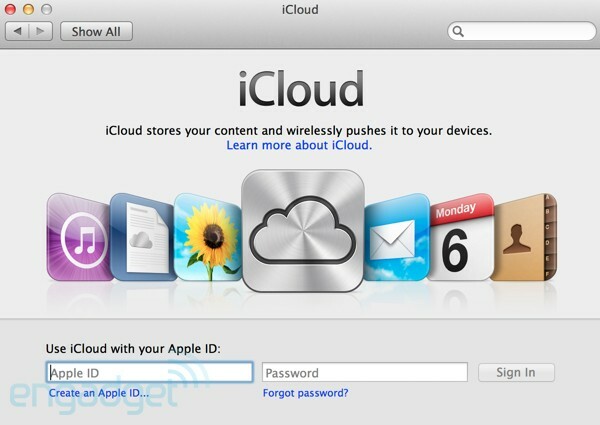 A feature that was unavailable back when Mountain Lion first arrived in beta, the Documents Library marks a big step forward for iCloud. Just save something in a cross-device app like Pages, and it offers up a drop-down menu of locations, starting with iCloud, which makes that file accessible on devices signed into that account. Accessing the Library is as simple as clicking Open in an app with that functionality. From here, you can open the doc to read or edit, duplicate it, rename it or transfer it via email, AirDrop or Message, courtesy of the Share button. Docs can be viewed as icons or lists, and can be sorted by name, date and size. You can also create folders by dragging one doc onto the other, iOS-style. 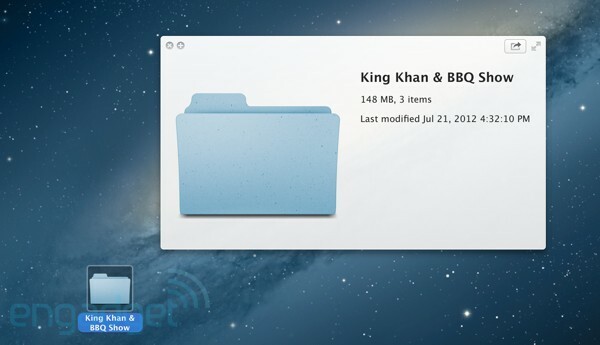 Documents can also be dragged and dropped from the Library onto your desktop and vice versa. Pinch-to-zoom, another "sure, why not" feature, has been brought over to TextEdit, letting you adjust text size using the trackpad. It'll save your cursor a trip to the toolbar, but mostly it feels like another step in Apple's eventual plan to incorporate that functionality into all of its native apps. And, again, why not? The MacBook's got a great trackpad -- might as well get as much use out of it as possible. Still, the implementation isn't perfectly smooth here -- once pinched, the text takes a moment to snap into place. The Auto Save functionality introduced the last go 'round has been peppered with some additional features. Clicking the name of an open file in TextEdit brings up a number of features, including Rename, Duplicate, Move To, Lock and Revert. Choosing Rename highlights the title, offering up a quick and easy way to affix a new name to the file. Command-Shift-S and Command-Shift-Option-S have been added to the keyboard shortcut arsenal for easy access to Duplicate and Save As, respectively. The "Move To" option, meanwhile, offers Apple yet another opportunity to integrate iCloud, letting you transfer anything saved to your desktop to that ethereal land of infinite document sharing. Actually, by saving to your desktop, you've already skipped out on an iCloud opportunity. Apple has front-loaded the feature, making it the default location for saved documents. Of course, you can also save to your desktop, if you're still living in a localized, pre-cloud universe. 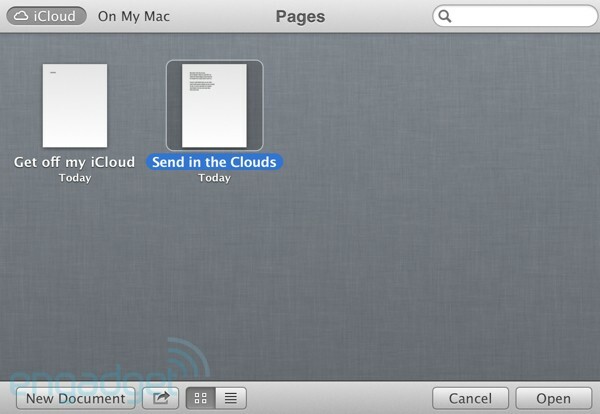 Saving to iCloud lets you share your documents across other OS X devices. If you want to edit a doc created in TextEdit on an iOS device, however, you're out of luck -- it only works on Mac-to-Mac transfers for the time being. If you save a file in Pages, however, you'll get that cross-platform functionality. 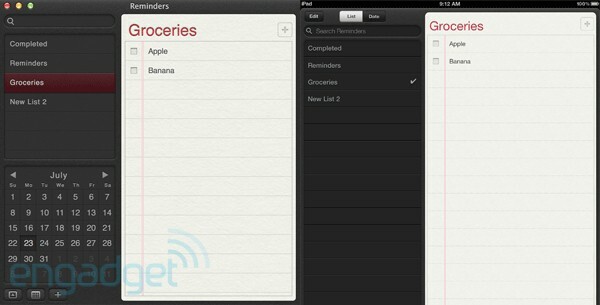 iCloud plays a key role in Notes, another feature borrowed wholesale from iOS. Apple describes its functionality thusly: "Jot down things you need to remember and easily find them later." Easy enough -- and really, it's mostly as simple as it sounds. After all, it was a program designed for making quick notations on the go, on a small screen. The program does, however, offer up more functionality than its Post-it-esque predecessor, Stickies (which, for the record, managed to avoid the 10.8 chopping block). The interface looks like a pad of well-loved legal paper, with a few sheets already ripped out. Typed text shows up on the notebook lines in customizable and optional bullet points and numbered lists. Images and attachments can be added as well, simply by dragging and dropping them directly onto the app, for a more accurate representation than you're likely to be able to sketch out on your real-life notepad. Handier still are links, which, when highlighted, can also be dragged and dropped right onto the paper. Along the top, you get the date and time and an option for expanding the little app to full-screen, if you're the sort who loves to cram a lot of information onto a single page. Along the bottom are a trashcan for dumping notes you no longer need (what, no crumpling paper animation?) and an option for sharing the text via email or Messages. To the left of the sheet is a list of the notes you've made and above that is a search bar for finding something amongst the pad. Double-click a note in the list, and it'll get "pinned" to the desktop, staying open after you close the app. At the bottom is a big Plus for making new notes. Click the button just to the right of that and you'll get a broader list of notes across devices. Yep, Notes is connected to iCloud too, getting pushed to connected devices in a matter of moments. Click the Plus icon next to the list items, and you can organize your notes into sub-folders. 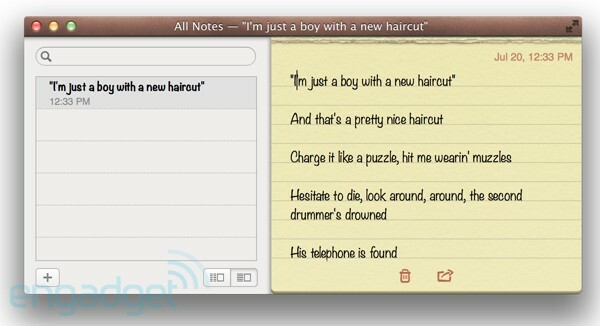 The addition of Notes in Mountain Lion makes the app all the more necessary for those using both OS X and iOS. It's a truly handy tool for keeping track of those little bits of information that might otherwise get lost in the shuffle. The changes to Autosave are welcome, as well -- anything that makes it harder for us to accidentally lose our hard work is alright by us. TextEdit has certainly received some nice boosts, particularly its broader integration with iCloud. Apple's clearly looking to take on Google Docs here, though we'd be hesitant to make the jump, given that Docs is more accessible on more platforms. If, however, you're an iOS / OS X devotee who already uses Pages, this integration will certainly make your life a heck of a lot easier. This is me trying out dictation. It seems be working out pretty well so far. I'm not sure if I could type an entire paper using this however. But perhaps for short things this is a good idea. I don't know, people in my office [are] probably going to stare at me funny if I keep using this to type all of my things. One or two fumbles. Still, not bad for a first go. And yeah, this writer has been told that he has a tendency to mumble. For periods, simply say "period." It's the same with commas and question marks and commands like "all caps" and "new paragraph." It's all quite straightforward and easy to use the first time you give it a shot. It currently supports US, UK and Australian English, Japanese, German and French. But again, it can't do much about your coworkers staring at you while you talk to your computer. The Mac App Store gets some upgrades here, too: app update notes show up in the Notification Center, you can use the trackpad to swipe between pages in your App Store history and a Share button lets you broadcast your app discoveries over Twitter, Messages and Facebook. And since ML is only available through the App Store, it makes sense that all OS X upgrades come through there as well, downloading automatically for your installing pleasure. App updates auto-download as well, and all new applications you download will get pushed to other computers tied to your account. 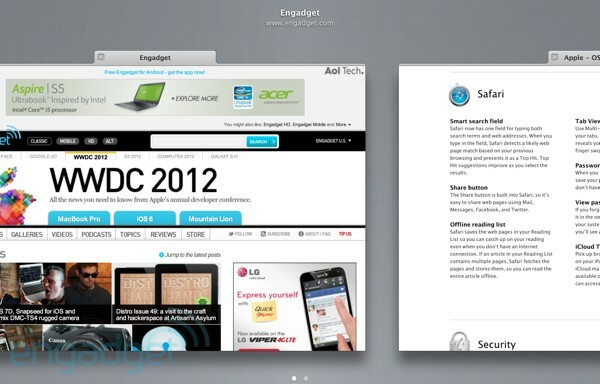 A tale of two Game Centers: Mountain Lion, left; the new iPad (cropped to fit), right. Oh, how people would have laughed at you 10 years ago, had you told them that one day, Apple would become a kingpin in the gaming world. Yet in a relatively short amount of time, the company has managed to go from a virtual non-presence in gaming to the creator of one of the industry's most popular platforms. Of course, that popularity grew mostly independently of Apple's desktop operating system. Having managed to capture the imagination of slews of mobile gamers, the company is now looking to translate some of that success into the desktop experience, offering up an OS X version of Game Center, the social gaming experience first introduced for iOS 4. The primary reasoning behind bringing the feature over to the desktop seems to be the opportunity to allow OS X users to compete against iPhone and iPad owners in multiplayer games in an already bustling ecosystem (with 130 million registered accounts, as announced at WWDC last month). Sign in with your existing account and you'll bring over your info from iOS. Through Game Center, you can find friends and opponents. Game Center also offers up in-game voice chat, parental controls and, of course, notifications, which alert you to friend requests and invitations, and tell you when it's your time to play a turn-based game. Unfortunately, you're going to have to re-buy / re-download the OS X version of the games -- and at the time of this review, that selection is pretty sparse. 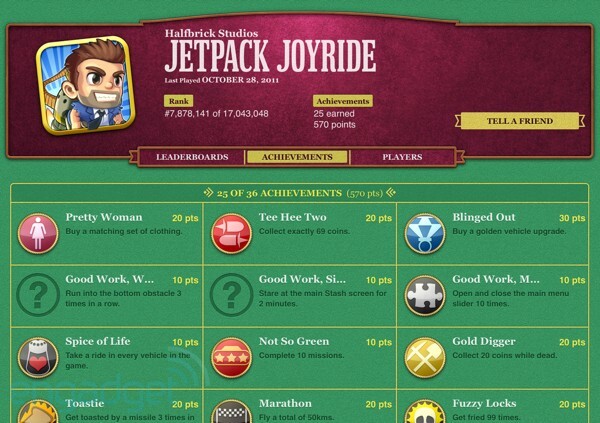 We can certainly see the appeal of maintaining scores across devices and playing against pals with iOS, but at the moment, we can't see the desktop version of Game Center becoming vital gameplay -- at least not in the near future. This can all be adjusted by making your way into the Security and Privacy pane in System Preferences, where you can ratchet up the security (allow applications downloaded from Mac App Store) or pare it down (allow applications downloaded from anywhere). Apple would no doubt love to keep your downloads restricted to its tightly vetted App Store. But even extended to include non-App Store downloads by companies with a Developer ID, legit programs can still get flagged (see: Spotify). Of course, Apple's been working double-time to get developers signed up ahead of Mountain Lion's launch -- and, worst case scenario, you can always switch your system settings when you need to download an app not listed in Cupertino's database. Though Gatekeeper is the primary new security addition to Mountain Lion, Apple's got a few more tricks up its sleeve to tackle the aforementioned ever-growing threat against OS X. For one thing, the OS promises to check for security updates every day. Also, Safari, Mail, Reminders, FaceTime, Game Center and Notes all join the list of sandboxed applications offered up by Apple. Kernel ASLR malware protection is on-board as well, along with new FileVault management tools. According to Apple the encryption being offered up is currently in the process of getting its FIPS 140-2 certification, to help it hit the government's standards. We're not yet seeing the kind of focus on security enhancements that Microsoft will talk up with each new release of Windows, but Apple does seem to be coming to grips with the fact that, yes, Macs can get malware. As ever, Dashboard is always just a three-finger swipe away. Not a ton has changed from a UI standpoint, but Apple's apparently looking to bring more folks over to the barebones interface by making widgets easier to discover. Swipe your way in and you'll see Plus and Minus buttons at the bottom of the screen. Clicking Minus brings pop-up Xs on top of your widgets, so you can get the ones you don't want out of your sight (so long, Ski Report). Hitting the Plus will bring a list of all the default widgets -- pretty much the same selection offered up in Lion, albeit in a slightly roomier configuration. Click a widget and it'll appear on your main Dashboard page. You can also hold down on a widget and then click to transfer it to the front of the Dashboard. Along the top of the page is a search bar so widget hoarders can find an item amongst the clutter. As you type, widgets that don't match the description will begin disappearing. Need something that's not stored locally? Click More Widgets and you'll be magically whisked away to Apple.com's Dashboard page, where you can download around 3,900 widgets -- at last count. Oh yeah, and you can add widget folders to the list of borrowed iOS features. 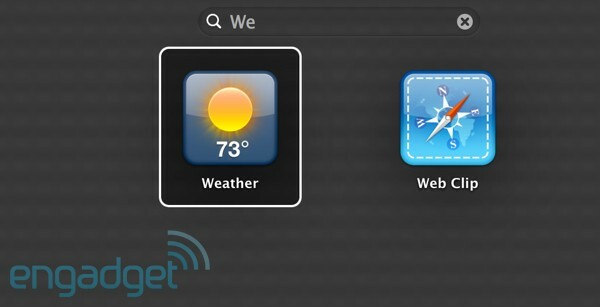 From the Dashboard browser, simply drag on widget icon onto another and the screen will split, revealing the contents of your newly created folder. Once created, you can keep dragging more icons into the folder (you can't drag a folder into a folder however -- let's not get greedy). To make a folder disappear, simply drag all of its contents out. Launchpad, Lion's boldest step toward an iOS-like interface, is still present in Mountain Lion, accessible via the dock, a click of F4 (on newer-model MacBooks) or by pinching the trackpad with three fingers and thumb. The Mac app interface looks nearly identical to its predecessor: rows of mobile-inspired icons atop a blurred desktop backdrop. As with Dashboard, however, Apple's added a search bar to the top of the screen, with irrelevant apps disappearing as you type. Apple has also done a bit to make Universal Access more, well, universally accessible, beginning with the name, which has been truncated to Accessibility -- a name borrowed from iOS (naturally). The pane offers up various options to help users with disabilities customize their experience (it's possible for both sighted and visually impaired people to do this). Apple has also improved Accessibility through a new keyboard shortcut -- Command-Option-F5 -- which brings up a simplified version of the menu, anywhere in the operating system. From here you can enable the zooming of features (via keyboard shortcuts or scrolling), VoiceOver, adaptable keys and display configurations like color inversion and contrast adjustments. More complex Accessibility features can be accessed by hitting Preferences in that window, or by locating them the old-fashioned way, through System Preferences in the dock. In Mountain Lion, the settings are a bit easier to navigate -- a vital consideration for this user group. The push buttons on the top of the pane have been traded in for a simpler, easier-to-navigate side panel with large icons, offering up options in the category of Seeing, Hearing and Interacting (which combines the Keyboard and Mouse & Trackpad offerings from Lion). Again, simplicity is the thing here. Graphical user interfaces can be quite difficult to navigate for the visually impaired and people with other disabilities -- there's no need to clutter them up unnecessarily. The visual element of VoiceOver's spoken text. 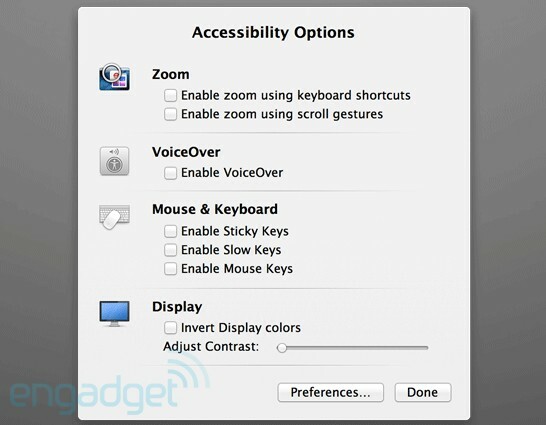 Mountain Lion's also ushers in some revised features in Accessibility. VoiceOver, which translates onscreen elements into spoken text, gets the most love here, with drag-and-drop functionality coming via modifier keys and the ability press and hold buttons and reorder tables. The latest big cat release also sees the introduction of 14 new braille displays. There's nothing particularly groundbreaking on this front, but it's definitely nice to see Apple expand its support for disabled users. What's the old saying? If you can't nap longer, nap harder? Pretty sure it's something along those lines. That's the driving force behind Power Nap, an attempt to put your system to work, even while it's sleeping. The new feature, introduced in 10.8, works while your system is in sleep mode, whether plugged in or on running off of battery power, performing Time Machine backups and delivering updates that you can install the minute the machine wakes back up. Mail, Notes, Reminders and Messages all get delivered as well, without the addition of fans or system lights. And, it works whether your machine is napping with its lid up or down, all without spinning up any fans or using a lot of power -- however, it's only going to work if your system has flash-based storage. Pretty cool feature, all in all. Even poor, oft-neglected Preview gets a little bit of feature love this time out. The image / PDF viewer gets sprinkled with the normal assortment of Mountain Lion features, including Sharing (via Email, Message, AirDrop, Twitter, Facebook, Flick and iPhoto) and Documents in the Cloud, so you can check out those images and PDFs on the go -- pretty handy, that. The PDF functionality gets some bumps as well, detecting text fields for you to fill out and letting you add inline notes. You can also search notes and highlights and plug scanned images and pages into PDF, going a ways toward making you a little less reliant on yet another Adobe product. Oh, Apple, you scamp. 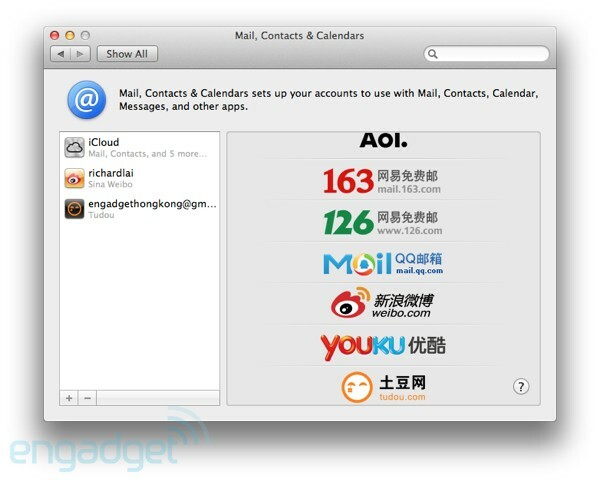 Given Apple's growing presence in China, it should be no surprise that Mountain Lion comes with plenty of localized goodies designed to lure in more desktop users there. For instance, those who choose China as the system's region will see a few extra options in "Mail, Contacts & Calendars" under System Preferences (after logging out and back in again, that is). Three of those are popular Chinese mail services: 163 Mail, 126 Mail and QQ Mail. You also get Sina Weibo -- China's most well-known microblogging platform, which works very much the same way on Mountain Lion as Twitter. Finally, for video sharing, the list includes Youku and Tudou, though strangely enough, these are only via the Share button in QuickTime and not iMovie. 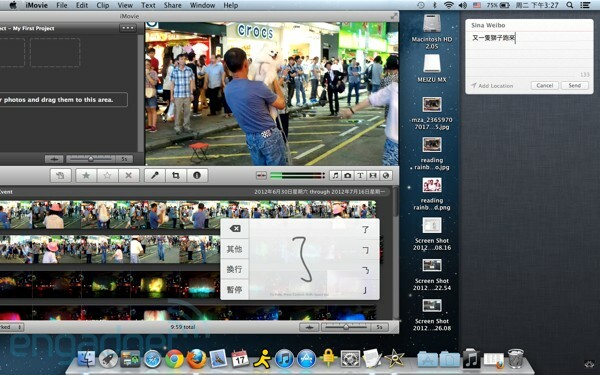 We guess it's only a matter of time before Apple provides a more convenient way for Chinese users to share their videos. Most other Mountain Lion features for China are related to text input. While we're not exactly experts in every single type of Chinese input method, Apple claims it has significantly expanded on the existing offerings, especially handwriting recognition and the pronunciation-based Pinyin (including the newly added Fuzzy Pinyin to cater to different regional accents). Most notably, in Pinyin mode you can now type in English within a Chinese sentence without having to switch keyboards like in the olden days -- your English words would simply show up as an option in the suggested word list. Speaking of which, Mountain Lion will also quietly update its library to enhance its phrase suggestions over time, and the Chinese user dictionary gets the same iCloud sync treatment as its English counterpart. If you do get stuck with certain Chinese words, fret not, because OS X will now come with a simplified Chinese definition dictionary, so you can look up Chinese words by tapping on them with three fingers (tip: if your system's set up in English, you'll need to activate the Chinese dictionary in the Dictionary app). Alas, this is only a Chinese-to-Chinese dictionary, and it's just in simplified Chinese (Hong Kong, Macau and Taiwan still use traditional Chinese), so some users will still have to rely on third-party solutions. Other tidbits include the addition of Baidu as an optional default engine in Safari (to be honest, many advanced users would probably prefer sticking with Google for all sorts of sticky-icky reasons), as well as eight new Chinese fonts (though only four of them include traditional Chinese characters). Scrolling with Dinosaurs: The standard bar, left; the expanded version, right. The most prevalent tweak on the system side has to be the beefed-up scroll bars. Anyone who's had trouble grabbing ahold of the disappearing / reappearing page movers will appreciate the ability to expand / change the color of the things by hovering over them. Those engaging in screen sharing, meanwhile, will like the ability to just drag and drop files between computers for transferring. The full-screen app mode, which was introduced back in 10.7, has been extended to secondary displays. This isn't a huge change, mind you -- in Lion, you could have an app go full-screen in an external monitor, so long as it was set as your primary display. Also, as with Lion, your other monitor will be blocked out when in full-screen on one of the displays, which kind of defeats the purpose of the whole dual-monitor thing. Screen saver gets a little love, too. There's a slew of new slideshow viewing options, including a panning one named after our documentarian pal Ken Burns, who already got a nod over in iMovie. Click one of those options and you can choose the source of your photostream from a drop-down menu, including default folders like National Geographic, Aerial and Cosmos or your own shots. The new Faces feature in iPhoto lets you tag people in pictures, making it easier to choose images when time comes to pick a profile pic or putting faces to the names in Contacts. While we can't personally claim to be heavy Font Book users, the new Smart Collections feature is pretty neat, letting you group different styles together by refining search criteria. Speaking of collections, the Xsan 3 cluster file system is on-board for shared storage, as is X11 install, if you should happen to need it for a particular app. Apple hinted at some small performance enhancements, but the company isn't exactly broadcasting them as a selling point for 10.8. Overall, we found the performance to be quite brisk -- we ran our standard OS X benchmarks, Geekbench and Xbench, and saw slight performance boosts versus the numbers we got with the same Retina display MacBook Pro running Lion. It wasn't a huge gain by any stretch, but we'll never argue against a performance boost, no matter how minor. Photo Booth's getting Sharing, naturally, with options including AirDrop, Messages, Mail, Facebook, Twitter, Flickr and Vimeo. 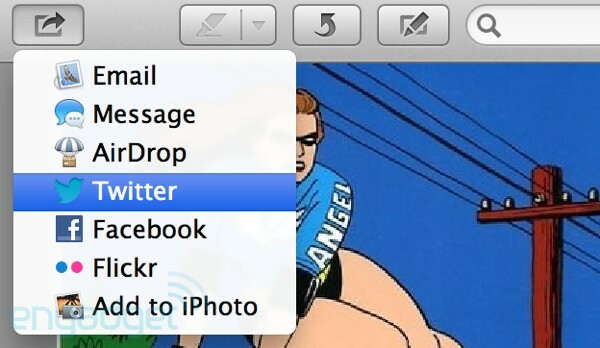 The Sharing menu also makes it possible to pick a new Twitter profile picture directly from Photo Booth. That old Apple workhorse videoplayer, QuickTime (now in version 10.2), gets a couple of minor upgrades, including "high performance" H.264 encoding. Naturally, too, you get built-in sharing here, letting you share the next Citizen Kane via email, Message, AirDrop, Facebook, YouTube, Vimeo and Flickr. Time Machine gets simple encryption this time out -- just click Encrypt Backups during the setup process. It's also possible to choose multiple locations from within Time Machine, so you can backup your computer to work and home drives. The Dictionary gets some trackpad functionality in this build, as well. Now you can use a two-fingered swipe to flip back and forth between searches, just like the olden days when they used to make books out of paper. Mountain Lion also now offers dictionaries in Simplified Chinese, Spanish and German -- weirdly, there's no share button here. We can't be the only ones who were looking forward to posting some hot definitions on Twitter. Let's get this out of the way, shall we? Does Mountain Lion justify its $20 price tag? Yes. Of course it does. If you're an OS X user with a reasonably new piece of hardware, stop what you're doing and upgrade now. There are 200 features here -- odds are you're going to discover a couple you like. Better yet, if you picked up your system from Apple or an Apple Authorized Reseller on June 11th or later, you can get it for free. AirPlay Mirroring, Messages, Notifications and some great new uses for iCloud make for an extremely solid upgrade. In our time with the new operating system, we experienced no major issues; just rare hiccups that are likely to be fixed in a system update. Heck, even the installation went smoothly. Apple devotees will find a lot to like amid the long list of tweaks and new features. Does Mountain Lion justify its $20 price tag? Yes. Of course it does. Taken as a whole, the features mark a fairly aggressive bid to fold the best of OS X and iOS into one product -- a strategy we first saw with the introduction of the Mac App Store on Snow Leopard, and with the arrival of Launchpad last year in Lion. Fears that the operating system has become more walled-off in the face of these moves are mostly overblown -- for now, at least. GateKeeper and the App Store hint at how Apple might seek to regulate the OS X experience to the degree it does on iOS, where content from outside the App Store's heavily vetted selection is strictly forbidden (though not expressly illegal, of course). Moving ahead, we hope the company continues to allow end users to download whatever they please. As for that question of precisely how fresh OS X feels -- it's not quite fair to compare the change between Lion and Mountain Lion to the steps between Windows 7 and 8. After all, the company has mostly been keeping to a yearly upgrade schedule, and while OS X has maintained a fairly consistent aesthetic presentation since it was first released in the world back in 2001, every upgrade has brought with it key features, and the end result is a very different operating system than the one we were introduced to more than 10 years ago. Tim Stevens, Richard Lai and Zach Honig contributed to this report.